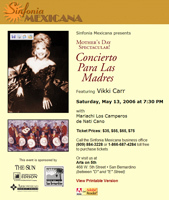 Sinfonia Mexicana has been thrilling audiences since 1985 when Mario Porras and Charles Eisenhard inspired members of the Inland Empire Symphony Association, local civic leaders, and then Consul of Mexico Emerenciano Rodriguez, to form a committee to present a unique concert of Mexico's symphonic masterpieces. Consul Rodriguez was selected to chair the committee for this exciting endeavor. The concert was a tremendous success! Enthused, the committee continued to present annual state-of-the-art musical and culturally enriching programs for the enjoyment of the entire community. 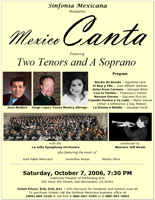 It is a well-established fact that Mexican folkloric music is enormously popular and world-renowned, however, what was relatively unknown to many people locally, was México's veritable treasure of classical and symphonic music created by notable composers and arrangers - many of whom Sinfonia showcased over the past 19 years. They included: Carlos Chávez, Pablo Moncayo, Manuel M. Ponce, Silvestre Revueltas, Miguel Bernal, Blás Galindo, Juventino Rosa, Enrique Mora, Manuel Enriques, Ricardo Castro, Candelario Huízar, Felipe Villanueva, and others. To be sure, Chávez's "Sinfonia India " is a fine example of the unification of Yaqui and Seri indigenous melodies into a symphonic masterpiece. A typical Sinfonia program of Mexican classical music often features a guest conductor and/or artists from México performing with the San Bernardino Symphony Orchestra at the historic California Theatre of Performing Arts in San Bernardino . Guest conductors have included Abraham Chávez, Sergio Cardenas, Francisco Savín, Guadalupe Flores, Eduardo Diazmuñoz, Enrique Diemecke, José Hernandez, Stewart Robertson, and Jeff Nevin. On two occasions Sinfonia had the distinction to host the "Orquésta Sinfónica Nacional de México" in San Bernardino . On their first visit, Maestro Francisco Savín served as musical director. On their second, Maestro Enrique Diemecke directed the Orquésta as part of a national tour of seven U.S. cities in honor of the 100th birthday celebration of México's premier composers Carlos Chávez and Silvestre Revueltas (Diemecke is currently the artistic director of the Long Beach Symphony). Instrumental guest soloists have included Carlos Prieto, cello; Jorge Juarez and Maria Teresa Rodriguez, piano; Miguel Alcazar, guitar; Roman Revueltas, violin; Elena Duran, flute; and Manuel Arpero, trumpet. Sinfonia commissioned Maestros Mateo Oliva and Mario Kuri-Aldana to arrange into symphonic form romantic ballads by beloved Mexican composer, Agustín Lara. The world premiere of the concert in San Bernardino was an international sensation. That cutting edge program was the most popular classical concert ever presented in the Inland Empire - drawing audiences from México City , Los Angeles , San Diego , and beyond. Special guests included Lara's widow and famous contemporary songwriter, Roberto Cantoral, and numerous luminaries. Sinfonia has presented a variety of special performances by outstanding ensembles from México and Southern California . They featured the West Coast premiere of "Navidades" by the internationally acclaimed Balle t Folklorico de Amalia Hernandez from México City . And, from Baja California , Sinfonia presented "Bastian y Bastiana" Mozart's comic opera performed by a student group, Grupo Juvenil de Tijuana . Moreover, Sinfonia presented the West Coast premiere of the first Chicano opera, "Esperanza" composed by David Bishop and the libretto by Carlos Morton based on the classic cult film, "Salt of the Earth." The opera was performed by the Euterpe Opera Theatre of Pasadena, which featured soprano Ariella Vaccarino and tenor Eric Castro. 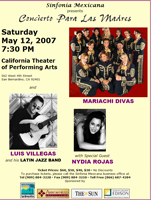 Quintessentially popular mariachi performances have included the legendary Los Camperos de Nati Cano, Sol de México de José Hernandez, Las Reinas de Los Angeles , Mariachi Mujer, Mariachi Divas, and Mariachi Champaña. Other diverse artists included Latin jazz great, Tito Puente, the romantic trio, Los Tres Reyes , famed folklorists Tlen Huicani ( Veracruz ), and the brilliant Ballet Folklorico del Pacifico . 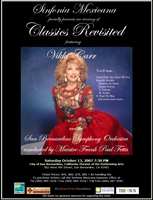 The famous pop artist, Vikki Carr graced Sinfonia's portfolio, as did Alicia Juarez (widow of José Alfredo Jimenez), Lalo Guerrero, Mayor Judith Valles, sopranos Maria Luisa Tamez and Florencia Tinoco; tenors Alejandro Guerrero, Pedro Rey, Raul Hernandez, Dennis Meade, Daniel Hendricks, and the West Coast debut of tenor Daniel Rodriguez performing with a symphony orchestra (the former New York police officer who awed the nation with his rendition of "God Bless America" in the aftermath of 9-11). Sinfonia endeavors to help promote the musical careers of local young aspiring artists such as Elizabeth Quintero and Desiree Flores. 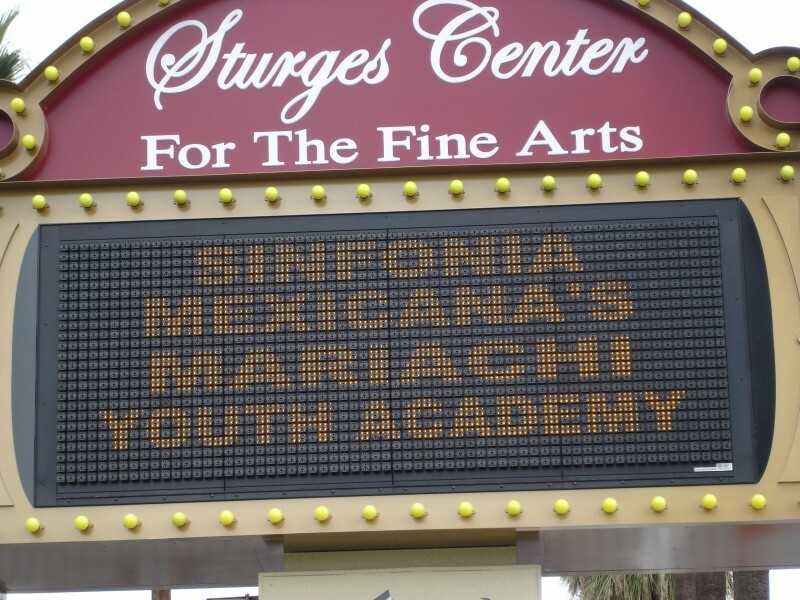 Sinfonia supported the very first youth mariachi in the region, Mariachi Estudiantíl and founder Lou Herz, whom Sinfonia sponsored for several years, and supported the debut of the region's first all-girl, Mariachi las Princesas . Sinfonia is now organized as a non-profit 501 (c) (3) organization and yet maintains its volunteer-driven mission to foster the awareness of México's symphonic musical masterpieces, and educate the public of the fine music and culture of México. The board of directors and staff invite interested members of the community to become involved in Sinfonia Mexicana programs. Please install a media player plug-in supporting m3u/wma media! You may need to select the above control once to activate it!